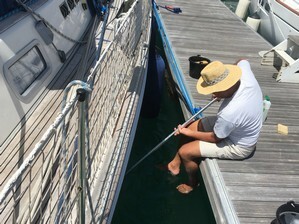 After Easter, we moved Ngahue IV from her mooring buoy with Conch Charters in Road Harbour to Nanny Cay marina, which will be our point of departure for this year's ARC Europe. We had already had our main engine and generator looked at when we were in Road Harbour, and both are now working very sweetly. At Nanny Cay further attention has to be given to our freezer compressor (that stopped a day or so out of Tortola) and our Iridium IOP (Pilot), which garbles and loses our "voice" communications! We'll also give our safety equipment a good going over so that the ARC inspectors will give us a clean bill of health to set out on the ARC Europe trip! The Iridium turned out only to need a complete reset, although our service provider, the AST Communication group, made us jump through multiple hoops, at times suggesting that even our Furuno open array scanner could have zapped our Iridium aerial. The latter is looking very yellow indeed, compared to other Iridium aerials that were installed about the same time as ours. So ours is definitely not very UV-proof. Our freezer turned out to be OK too - it had just stopped working en route to Tortola because the voltage on our batteries had dropped below a critical level set by Webasto. I improved some of the insulation of the compressor lines leading to the freezer box, as well as the freezer lid itself. We then very carefully brought the freezer temperature down to -3°C and then, finally, -12°C (measured at the lid, so in the bottom of the freezer it's about 1 or 2 degrees lower, which is what you need to keep deep-frozen foods frozen and OK for a period of 4-6 weeks at least (and even longer if you vacuum-pack it). We also cleaned out the engine room which had seen multiple engineers spill water, oil and coolant around it (a proper "ugh" job) and sought to acquire a new exhaust elbow for the Westerbeke generator. With this new elbow fitted, and the valve clearance properly set, our generator should be 90% as good as new... Not bad for an elderly lady, even if she only has about 570 hours on the clock at the moment! 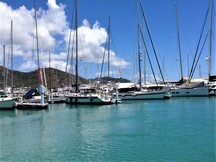 We arrived very early for the ARC Europe in Tortola, where you get an initial clearance for 30 days. 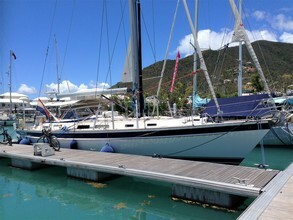 As we were going to stay 6 weeks in the BVI, we would need to seek an extension of our stay, so we were told when we cleared in. "You'll need to go down-town" was all we were told. So after nearly 4 weeks we went down-town to "Immigration" to obtain an extension for ourselves. But having arrived in Tortola by boat, Immigration wouldn't give us our extension until we had sought and obtained an extension for the boat. 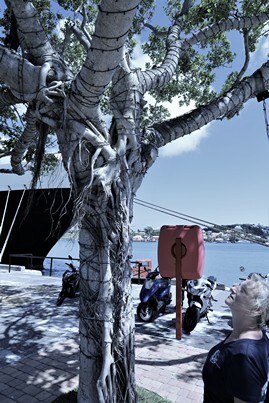 We needed to return to the harbour customs post, where we filled in (by hand) 2 forms in triplicate. Owing to the damage done by hurricanes Irma and Maria, customs is in a temporary office, where the officials have no photocopying equipment; so it is the customer who has to fill out all his or her own copies. 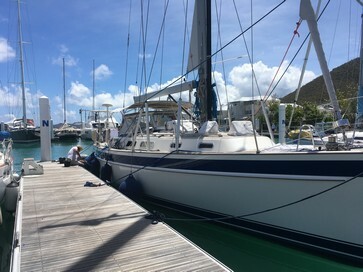 We temporarily imported our boat into Tortola (we're entitled to keep her here for a year) and returned to Immigration who could now properly process our own extension. It was granted for a period of 2 weeks... Once you know what to do and where to go, it's actually all quite simple. It's a pity though that no-one tells you in advance what to do; you're simply expected to know. And the Administration here comes across as very strict and daunting, though once you have an opportunity to speak to individual officers, people are generally extremely friendly, polite and helpful. Bearing in mind the damage wreaked by the two hurricanes last year, the Island's population has had to deal with much adversity. Having obtained our extension from Customs and Immigration, we walked around Road Harbour and found the big Rite Market outlet, one of the local supermarket chains that seems to have links with Waitrose, as there are lots of Waitrose products in their shelves... Rite Market also offers Internet shopping, so we checked out their product range so that we can organise our provisioning for the return trip to Europe better. This supermarket really had everything you could wish for; and they deliver to the boat! 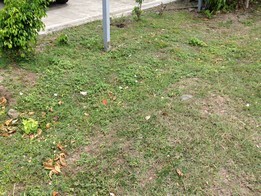 One of the surprising things of Tortola has been the abundance of butterflies both over the water and on land; each white or yellow point in the picture is one butterfly. And to think this picture was taken alongside a very busy highway. 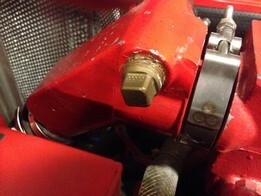 The red thing is an "elbow" in our generator's exhaust system. It looks OK on the outside, but the inside had been eaten away by seawater and hot exhaust gases. During our stay at Nanny Cay we managed to get a replacement part for it and have this fitted. Another surprising feature during our stay has been the intensity of tropical rain showers. We regularly need to bail out Poutini (our dinghy; see the Presenting Ngahue page for an explanation about Poutini) as water reaches the gunwhales after each prolonged tropical shower! Another pass-time has been to search to Internet to see whether we can constitute an as complete as possible list of Hallberg-Rassy 53 boats. It's painstaking work and often feels like putting together a jig-saw puzzle, or working on the family tree. But it has been interesting to see how far we could get... Of course if we had acquired an HR62, the job would have been a lot simpler as there are much fewer boats to account for ;-)). Then again, there was one Italian gentleman who took delivery of 3 HR53s throughout the 15 years that the Yard built them. As the HR annual Newsletter emphasised, each boat was better than the past. So tracking down these boats should have been easy - not always so, I'm afraid!!! Many HR53 owners upgraded to an HR54 though! Some of the corrections I've made on our home page are a result of all this research... 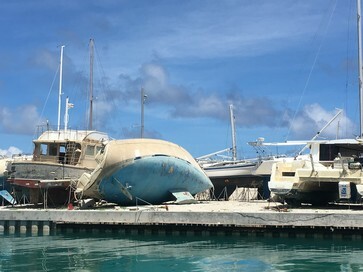 The ongoing maintenance of a sailing boat continues, even in port. And the waters here in Nanny Cay are warm and full of algae and growth. So a regular feature is also to remove the growth that day-by-day attaches itself to the hull! The ARC Europe "Yellow Shirts" (so called because of their distinctive yellow T-shirts they wear) arrived on 29th April and opened their Rally office on 30th April. 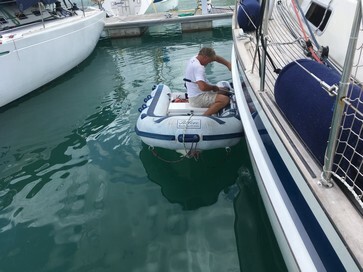 Participants and their boats were duly registered, checked, cross-checked and submitted to a safety examination before being given a final green light to participate in the ARC Europe rally. We received additional safety briefings, flares and liferaft demonstrations, and assistance with our provisioning. One of the shops we went to in addition to the two major supermarkets in Road Town was the French delicatessen shop. We stocked up with a bottle of Pastis de Marseille at $6.50 as well as a nicely matured Camembert at $21. So clearly it is much cheaper to get stone and blind drunk on Pastis, than to enjoy a piece of baguette with Camembert!!! 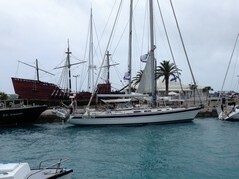 On 4th May Customs and Immigration came to Nanny Cay to check out and clear the ARC Europe participants. 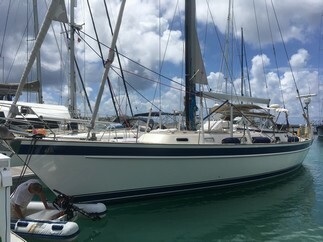 And after a skippers' briefing and a quiet last night, the rally left Nanny Cay marina on 5th May 2018 for the first stage from Tortola to Bermuda (St George's Town & harbour) in what promised to be relatively OK circumstances... Pictured here our clearance documents as well as my iPhone which is slowly losing its screen :-(. 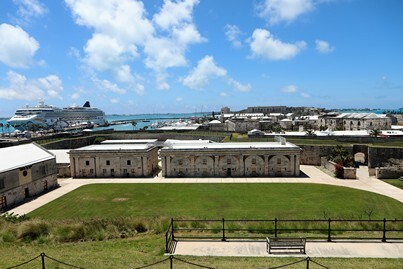 Our trip from Tortola to Bermuda was relatively uneventful: spread over 7 calendar days, we were at sea for more than five and a half days, arriving in Bermuda early in the morning. We had furled our genoa to 3 reefs to cut down our speed so as not to arrive in Bermuda during the hours of darkness. 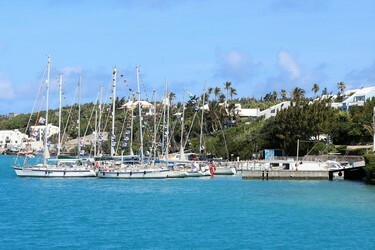 Bermuda is surrounded by reefs, and there's even an IMO (International Maritime Organisation) warning on charts that Bermuda is an area to be avoided. The island, or rather the 150 odd islands that make up Bermuda, are very low-lying and because of the heavy clouds, we didn't see Bermuda until we were only a few miless off shore. We were allowed to dock at Customs House immediately, were cleared to enter Bermuda with a minimum of fuss and a maximum of friendliness (a real and pretty unique experience to date), and sent to raft up to our Finnish colleagues on Lymikki just three boat-lengths away from the Customs dock. Saint George's Town is really pretty, with the oldest "working church" outside the UK in the whole world. 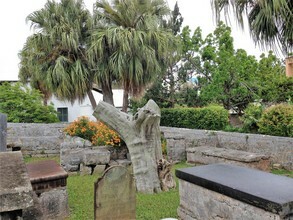 Below a picture of a beautiful tree in the churchyard. Suffice it to say that the interiour of the church is even more interesting!!! Having visited the oldest church in town, we also did some souvenir shopping. 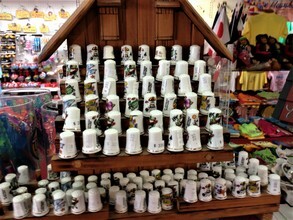 We try to buy a thimble in each place we arrive; usually you can find one or two models in a shop. In Bermuda we say whole stacks of them - they must be a popular and well-selling item!!! Our mooring turned out to be in the middle of the historic town centre... And a copy of the picture taken of us upon arrival at Customs dock! The actual trip itself was fairly routine, once we were back in our "ocean" habits. Many people wonder how we manage to run a decent watch system with just the two of us on board. Easy: we sleep in turns, usually when one of us is feeling awake and the other feeling sleepy - and vice versa. 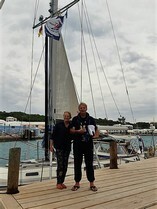 We were curious know how our neighbours in Bermuda, Juke and Jana on Lymikki manage and also race their boat, arriving pretty much first all the time, and beating the hell out of their usually (much) bigger competitors. The only interesting artefact we spotted en route was a floating orange boot. And lots of Portuguese Men-of-War... dozens and dozens must have passed the boat during this leg of the trip. The temperatures have really dropped, with nights descending to 18°C in the saloon! Brrrrrr.... We haven't had that for 5 months. Whilst approaching Horta, I tried putting together a short film which we will upload in the Azores. Hopefully the various shots will do some justice to the many sunsets, sunrises and things we saw during our nearly 2000 miles trip. Yes, we took the 'long-cut' again, ending out of time, i.e. the time allotted by the ARC for this stretch of the Rally. 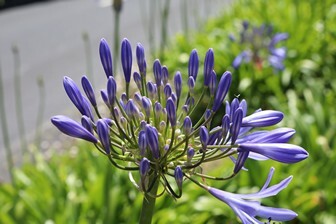 We arrived in Horta on 31st May, and as said, a couple of hours outside the ARC time limit. 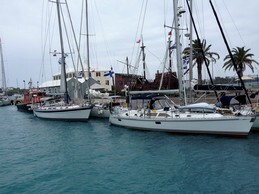 Three other boats were still at sea when we arrive, rafted up at the fuel dock in front of the harbour and customs office in Horta. 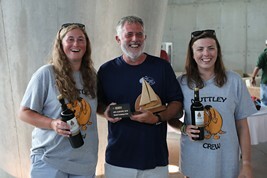 Most of the ARC Fleet boats had already been in Horta for a few days, so there was much catching up to do. We also needed to sort out some essential repairs; nothing drastic. But our Furuno (they say the part is from an external company - Airmar, so not their immediate fault) depth/log/sea temperature transducer had completely packed up! Furuno Germany had sent a replacement part which duly arrived and needed fitting. A lot of boats visit Horta at this time of the year, and the 28 ARC boats added to the harbourmaster's worries to find a place for us all. In the end, we inched our way forward from the fuel berth to just ahead of it to next to the harbour wall. This was easy for us to just step onto the quayside, but multiple fender socks were completely demolished, one fender board went AWOL (its ropes being chewed through), and a few serious discussions needed to be held with our neighbours who had failed to rig shore lines (all the weight hanging on to our cleats) and then lumped their heavy sail bags on our guardwires to get them ashore for repairs.